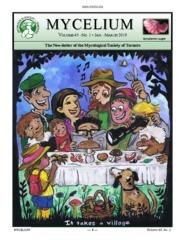 The Mycological Society of Toronto is a non-profit, volunteer-managed association of amateur mycologists and others with an interest in wild mushrooms and other fungi, based in Toronto, Canada. Our goal is to stimulate public interest in and appreciation of fungi and their role in nature, and we encourage activities that explore the ecological role of fungi and support the conservation of wild mushrooms. Members' interests are wide ranging in areas related to fungi, including mushroom identification, photography, cooking and mushroom cultivation. The MST organizes informal mushroom-gathering forays led by member volunteers to locations in Southern Ontario during the spring and fall mushroom seasons. Forays provide an opportunity for members to collect and study wild mushrooms and enjoy nature. During the winter, there are informative meetings with guest speakers presenting on topics associated with the field of mycology. We encourage interest from the public, and non-members are welcome to attend a meeting. The MST is always seeking new members - please contact us with any questions. MST 2019 Calendar Contest Now Open! Download the current issue of Mycelium in PDF format. A New Direction for the MST! The Ontario Poison Centre in Toronto is available 24 hours a day, 7 days a week, at 416-813-5900 and 1-800-268-9017.